For local events, I can provide my own self-contained high quality Bose sound system. 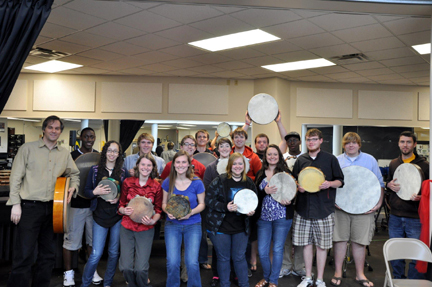 Designed for university percussionists, the Frame Drum Intensive Workshop is day-long instruction on the techniques for a variety of frame drums & tambourines. 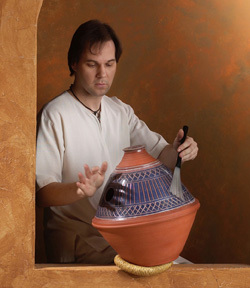 Percussionists are taught aspects of technique & rhythm for hands-only Bodhrán (Irish frame drum), Riqq (Lebanese tambourine), Pandeiro (Brazilian tambourine), Tamburello (South Italian tambourine), Kanjira (South Indian tambourine), Ghaval & Daf (Persian tambourines), and Tar & Bendir (North African frame drums). This workshop can be tailored to your students level and specific areas of interest. N. Scott Robinson's frame drum pieces published by HoneyRock are great learning etudes for recitals and learning aspects of some of his pieces are incorporated within the workshop. E-Mail N. Scott Robinson for other types of workshops that can include Berimbau, Kalimba, and creative use of the voice for percussionists (Hindewhu & Tuvan Overtone Singing). The Hand Drumming & Brushes Clinic shows percussionists practical applications with techniques they may already be familiar with. 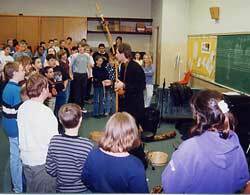 Technical issues such as combining Drumset independence, frame drum technique, and the timbral expansion of mixing brushes with hand drumming are presented on Bodhrán, Djembe, Udu, and Cajon so that percussionists are exposed to contemporary choices to help stimulate creativity and improvisation. This clinic draws on techniques covered in the Frame Drum Intensive Workshop above. With a 50-slide PowerPoint presentation, audio examples, and 1 hour of video clips, N. Scott Robinson details the history of improvising percussionists. 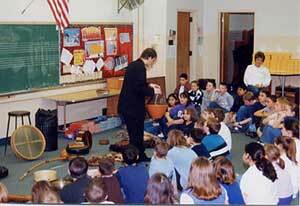 The New Percussionist shows students who the innovators were and what innovations they developed. Rare photographs and video collected from over 7 years of research will show percussionists all kinds of innovations in contemporary improvised music including the technical and timbral expansion of the Berimbau (Naná Vasconcelos, Okay Temiz, Dinho Nascimento, Rosario Jermano), the percussionist in jazz (Airto Moreira, Dom um Romão, Badal Roy, Guilherme Franco), expanding instrumentation and technique (Collin Walcott, Trilok Gurtu, Zakir Hussain, Arto Tunçboyaciyan), the technical expansion of frame drumming (Glen Velez, Carlo Rizzo, Selvaganesh Vinayakram), and much more. Percussionists are exposed to a great variety of rare performance footage that N. Scott Robinson places within a historical continuum of percussion innovation in contemporary improvised music. 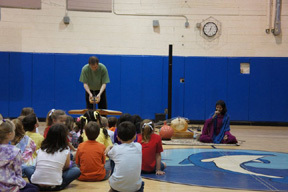 World View: An engaging multi-cultural school program for young students that features a variety of exotic instruments from different cultures, including the Steel Pan (from Trinidad), the Didjeridu (Australian wind instrument), Donso Ngoni (harp from Gambia), Ghaval & Daf (Persian tambourines), Udu (clay pots from Nigeria), Berimbau (musical bow from Brazil), Riqq (Lebanese tambourine), Tamburello (South Italian tambourine), Bodhrán (Irish frame drum), Kanjira (South Indian tambourine), Mbongo (elephant tusk horn from the Congo), Swedish & Native American Flutes, Mbira (hand piano from Zimbabwe), and much more. World View can be tailored for your assembly program by choosing the instruments & cultures you want from My Instrument Gallery. 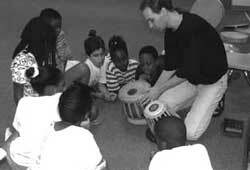 This presentation exposes your students to diverse ways of creating music, exposing them to aspects of geography, culture, musical techniques, creativity, and connections to nature. 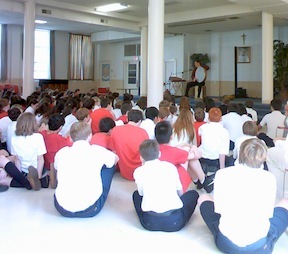 School programs are designed based on the needs and interests of each school and its students and involves some student participation, demonstrations, and live performance. A high quality Bose sound system can be provided if necessary. Contact N. Scott Robinson for more information about tailoring a program for your student assembly. A special duo version of World View is available featuring N. Scott Robinson and Indian vocalist K.S. Resmi.